Over the last decade, the sophistication of marketing departments has increased tremendously: marketing is more measurable, addresses multiple “channels” and is becoming highly targeted. There has also been an accompanying explosion in the number of marketing activities and therefore the number of products and services enabling them. 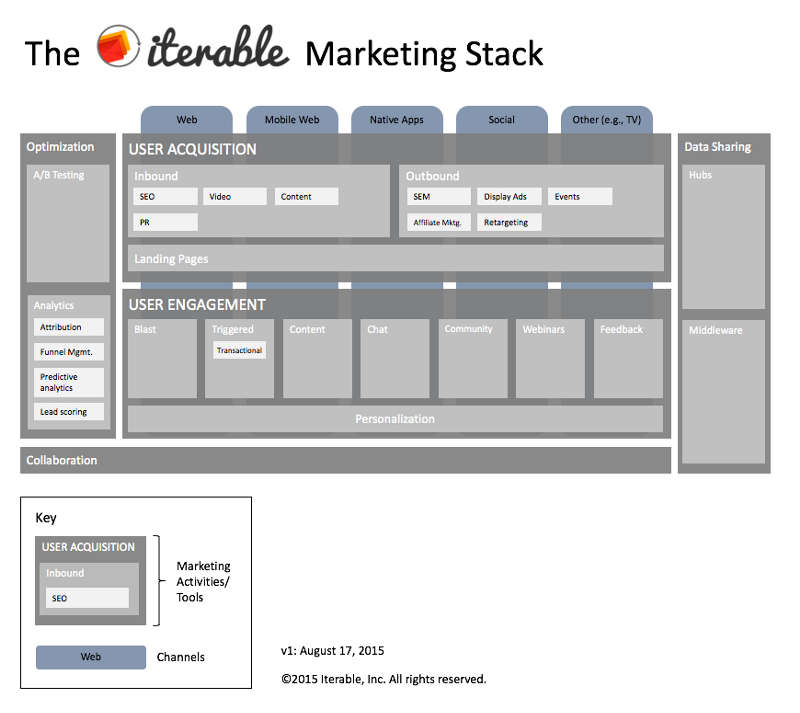 As a result, we’ve seen the emergence of the “marketing stack” concept — the collection of technologies/products/services that a marketing department uses to do their job. There is a lot of content out there mapping the stack (some good ones are Growthverse, chiefmartec.com’s Marketing Technology Landscape and Venture Scanner’s MarTech Ecosystem). Browse some of those links and you’ll see that there are hundreds, if not thousands, of companies attacking the marketing technology market from different angles. 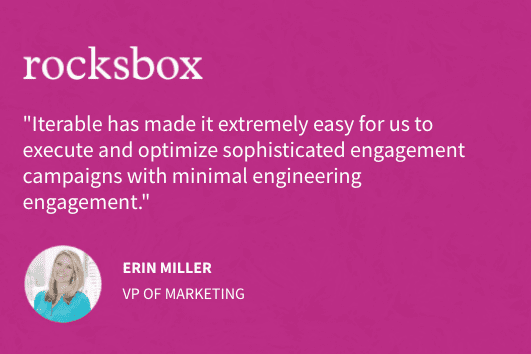 Of course, at Iterable we are a participant in this ecosystem — we help marketers send their customers the right message, to the right device, at the right time. Our customers are growth marketers at leading B2C companies, and a good growth marketer can always use a framework for understanding how something works, how to attack it and how to test and optimize. How the different tools fit together. What areas can best drive growth (and how). How a company’s stack evolves as they grow in size and sophistication. We believe that a deep understanding of these three areas would be very valuable in helping growth-oriented CMOs/VPs of Marketing understand what levers they need to pull and how they will change over time. 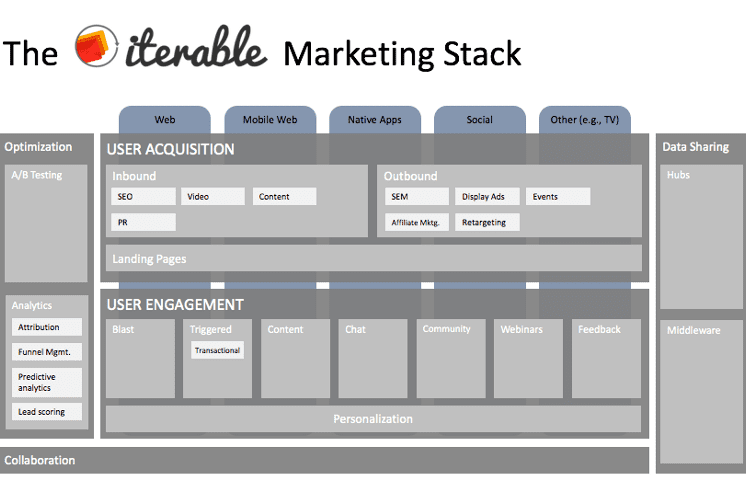 To start, here is version 1 of our “generic” marketing stack. This diagram maps out the key activities of a marketing department (without listing any companies) and proposes a way of envisioning how they fit together from a business and functional perspective. We think this is a fairly comprehensive diagram. Essentially all the marketing technology companies out there fit somewhere in this stack and, of course, many cross boundaries and/or attack their space in different ways. While most activities are relevant for both B2B and B2C marketing, a few are more specific. This version includes them all. User acquisition and user engagement are the key activities/goals of a marketing organization. All other activities (e.g., optimization) exist to make acquisition and engagement better and/or easier. The channels (e.g., web) “underlie” acquisition and engagement, although not all activities apply equally across all channels. “Acquisition” means some sort of conversion — it can be a website visit, collecting an email address or completing a purchase. “Engagement” is all about keeping a user/customer coming back for more (visits, purchases, etc.). Conceptually, you can envision users at the top of the diagram, interacting with the marketing organization via different channels on their way to being “acquired” and “engaged”. Likewise, you can envision the marketer at the bottom of the diagram, reaching out to customers by executing on their choice of activities across one or more channels. Many activities could have been subdivided even further as there is a tremendous amount of specialization in many of these areas. No diagram, including this one, can capture all the nuances of how different activities and tools fit together or interact. The notions of activities, channels, customers at the top and marketers at the bottom can break down when analyzed in different ways. We have focused strictly on marketing activities/tools and not sales activities/tools. While there is overlap, we have avoided including items that are more sales-focused in nature (e.g., CRM). Having said that, we think this is still a very useful tool and will serve our stated purpose. In the next few posts in this series, we will go into detail on what each piece of the stack encompasses and why we chose to lay out things in this way. More importantly, we will get to the three insights we mentioned above: how do the pieces fit together, how to best drive growth and how stacks evolve over a company’s history. Please let us know if you have any feedback! We realize there will be many different opinions on this and we look forward to refining things as we go.